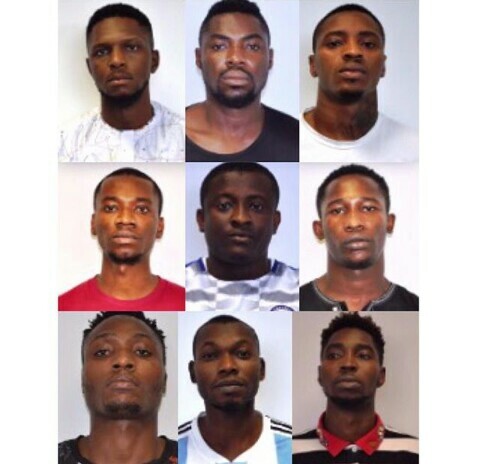 Nine suspected yahoo boys have been arrested by the EFCC in Abuja. They are: Edwin Ogbomwan, Okouromi Franklin, Oseji Collins, Collins Onyekwuluje, Anyanechi Ekene, Tony Oviasuyi, Chidi Emeshili, Osaigbovo Aiseos and Osaigbovo Ikponmnosa. . The were arrested on November 30, 2018, through an intelligence report received on the fraudulent activities of the suspects residing along Airport Road, as they were obviously living above their means. Operatives of the EFCC had carried out surveillance for days on their activities before swooping in on them.